Starting April 20th, Hennepin County (Minnesota, in the so-called USA) will be test driving a new self-driving, “smart” shuttle bus over the weekend. They chose a portion of the greenway bike path that passes through the heavily gentrified Uptown to demonstrate what is to come for other sections of the city slated for similar lines of development—as a laboratory of future control. On the night before they unveiled their project to their corporate partners, some antagonists hung a banner right in the shuttle’s path, with the intention of physically blocking the sensors of the shuttle, thwarting the test, if only for a moment. 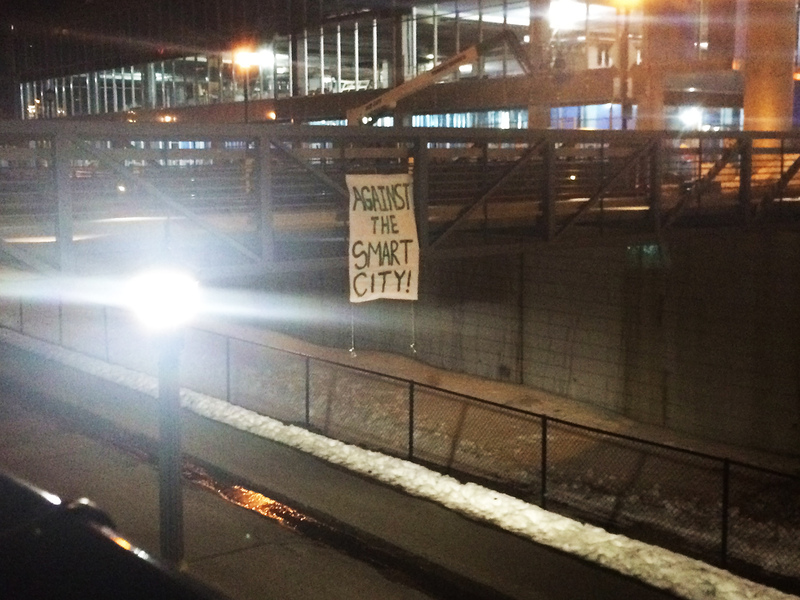 Against The Smart City! it declares. While touted as progress, there are still those of us who see these projects as only the further deepening of the desert. As our cities become increasingly automated, this process attempts to eclipse not only the possibilities of revolt, but even that of a life of anything but its perpetual (re)production. These automated shuttles will be yet another vehicle for funneling citizens between where the work, shop, and sleep, as mindlessly as the shuttle which carries them. This action was intended to demonstrate that these projects will face resistance. It was simple to carry out and took very little planning. The smart city is fragile, and opportunities for disruption are everywhere. While their fantasy is to build a terrain where all that can happen is what has already been predicted and planned, we know that fundamentally life cannot be reduced to data and in its flux escapes prediction and control. Don’t wait for others to take action for you. Take it yourselves.